BRYAN, Tex. (KBTX) - The Robertson County Sheriff's Office confirms a tornado was spotted in Franklin. Officials advise if you are in the area you should take shelter. Rounds of rain and a few thunderstorms are expected across the Brazos Valley Saturday. Some of those storms could be strong to potentially severe. 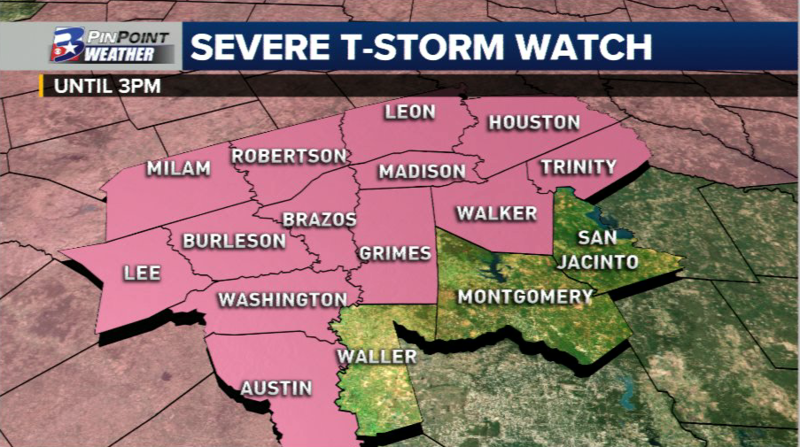 Active, stormy weather moving out of West Texas overnight is expected to create the same conditions for much of the state through the afternoon. Scattered rain & isolated thunderstorms are possible for the morning hours. A broken line of rain & storm activity is expected to cross the area from northwest to east/southeast between midday and mid-afternoon. Latest timing, potential, and concerns for the day are detailed in the video above.